Last week, special effects artist Richard Trammell digitally removed Tyler Durden from a scene in Fight Club, laying bare the madness of Edward Norton's Narrator and giving people a reason to slack off at their jobs for another 90 seconds. 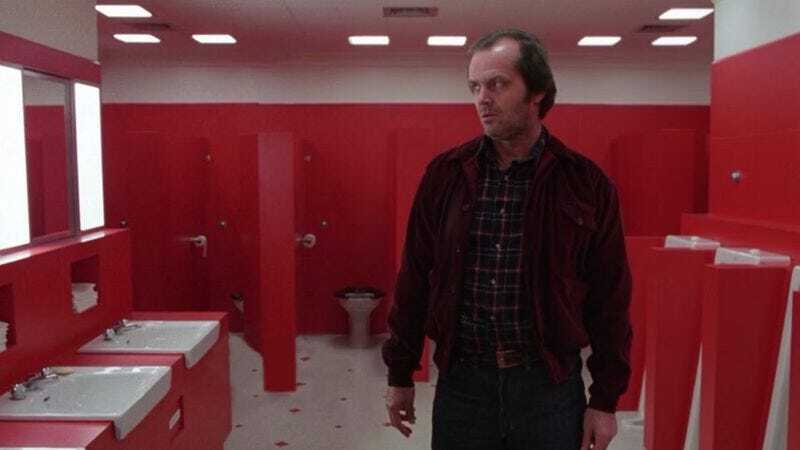 For his follow-up, Trammell has scrubbed Overlook Hotel caretaker/axe murderer Delbert Grady from the bathroom scene in The Shining, although he left Grady's dialogue intact because the character's existence is "a bit murkier" than Durden's. The editing brings more creepy to an already creepy scene, and makes Jack Nicholson's character look even more cuckoo's nest nuts than before. Trammell, who has quickly cornered the market on editing movie scenes to make crazy characters seem even crazier, has indicated he wants to give this treatment to more films, so by this time next week we may see his edit of A Beautiful Mind with half the cast removed.